Having recently completed my Digifant saga I thought I would post up a few pictures. The units described in this post are Digifant II part number 037 906 022AT built by KEN in Germany. Every failed Digi II ECU that I have opened up has looked like this inside. The two obvious symptoms of this failure are: the engine hardly runs and there is fuel in the oil. Two things can cause this: broken engine grounds or shorting the no. 1 terminal of the coil to ground. Here is a quote from the 85-92 A2 Bentley service manual, section 8 page 20 "CAUTION- Do NOT allow terminal 1 of the ignition coil to be shorted to ground when connecting test equipment as this will cause failure of the Digifant control unit." What happens is that the circuit board becomes the primary ground path for the ignition and injectors. This is far more current than the printed circuit board can handle. I ended up buying a re manufactured ECU from http://www.AUTOECMS.com because I couldn't find a working unit at any of my local junk yards. If you are buying a used ECU be sure to open it up. I made this mistake once and was out $200! I sent my original ECU back as a core and I am repairing the one I was stuck with. I hope that this will help some of you avoid your own Digifant saga. Good luck! Is this kinda like it. Looks like its been burned a little. My oil reaked of gasoline and my car wont start. It has compression, spark, fuel(obviously), and the timing is set. Here is my thread about this freaking headache. Heres my pics. You cant see it in my pics but those three pins to the right of your top pic are burnt also. Thank you for pointing me in the right direction. My friends didnt believe it was the ECU. 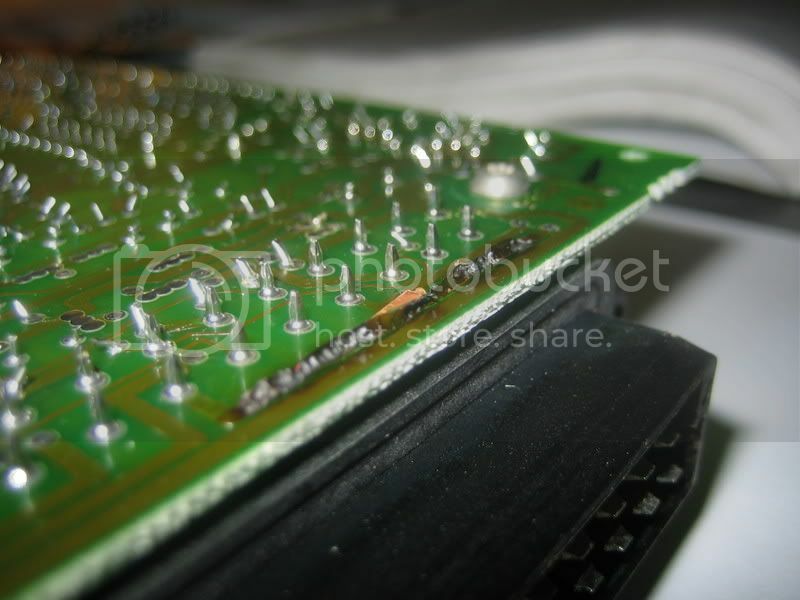 Is the trace the reason the ECU doesnt work or is it the the burn marks where the transistors come through the board? I have another ECU where all the traces are good but there are burn marks on the transistor pins. The burned trace and pins are all resultant damage of the ignition and fuel injection trying to ground through the ECU. Bad grounds and or a shorted no.1 coil contact are the actual cause of the problem. 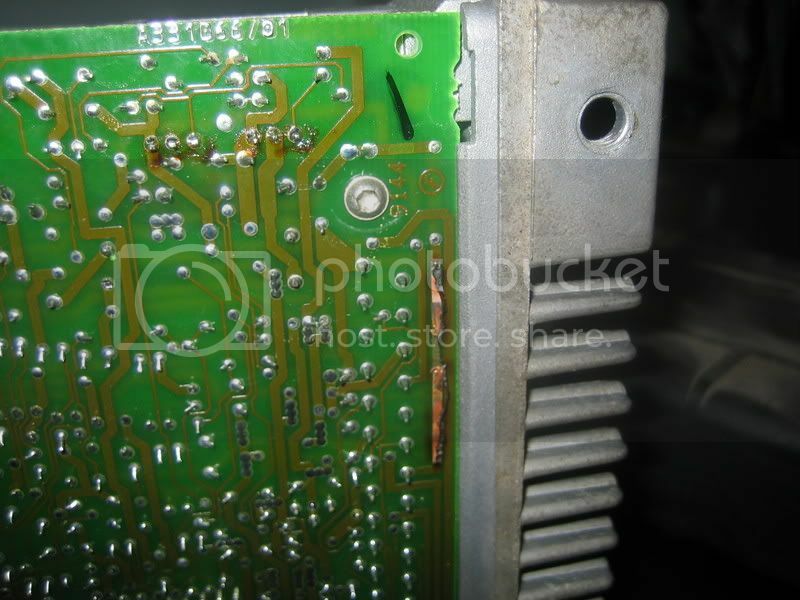 If your other ECU has burned pins it has also been damaged. You need to check the diode. I would not use an ECU with a different part number. The engine may run, but who knows what the fuel and timing maps look like. I have not tried a different part number. I am pretty shure that different horsepower engines have different part number ECUs. Can anyone else chime in on this? What ever you do make sure that you have your electrics sorted out BEFORE you plug in your new ECU!!! Buy a ground kit or build your own. Check your coil wiring! Also, don't forget to change your oil and splash a table spoon of it into each cylinder. Those rings are bone dry from all that fuel wash! Yeah, me and a buddy checked all the grounds and tested the wiring harness before plugging in the new ECU. I had already changed the oil. When I drained the oil it was like water coming out of the oil pan. Big props to you for this thread. You saved me some money. [IMG]http://*****************.com/smile/emthup.gif[/IMG] [IMG]http://*****************.com/smile/emthup.gif[/IMG] [IMG]http://*****************.com/smile/emthup.gif[/IMG] I was about to give up and have it towed to the nearest vw shop, pull my pants down, and get ready for it. Im about to go drink and celebrate.